News is scarce these days for the public. The truth is hardly even out there anymore. The algorithms put in place to filter what you are allowed to see are making it very difficult to find facts. This is wartime and we actually are existing in the fog of war. Only obscure, anonymous venues where obscure anonymous people join to dig relentlessly for the truth are keeping it provided to the people who want to brave those strange frontiers. Everywhere else is heavily censored or so riddled with enemy disinfo that very few questions can really get an answer. This includes the "alternative media". For this reason, i'm writing this. What is happening right now is, hands down, the most historic and supernatural series of events to happen in many lifetimes. Biblical in proportions. This is a report of the facts brought to you by The People. The world needs to know. Most importantly, Americans need to know. The MSM clowns have informed the public that a caravan of poor, disenfranchised families from Honduras and other central American countries are walking their way to the US border to attain the American dream. We're supposed to have our emotions triggered and sympathise with the imagery of women and children plodding along, escaping the horrors of the countries they left and we're supposed to be outraged at the President's adamant refusal to allow any of these people in. "but the poor kids"
The "migrants" who numbered around 5000 or so originally are now being joined by successive waves of thousands from Mexico. The final count may numberin the 100's of thousands. They are charging toward the US are not families fleeing their horrible countries. They are criminals paid by members of the global Cabal to Invade US soil. The children you see with them are the product they're bringing with them to be sold to suppliers of the ruling controllers' most desperate need. They're addicts. Imagine them as heroine addicts who have had their cartels cut off from them. These kids are meant to be harvested like livestock and literally consumed. Also in this hoard are the patsies of a demonic entity called Mara. They're better known as a "gang" and dubbed MS13, Mara Salvatrucha - 13. They are a death cult , not a gang. They very much believe in the rite of human sacrifice and inflicting the most horrific deaths imaginable on their victims. While the world is watching the "plight" of the poor immigrants some of us are aware that this is an invading army - the last defense of the dying establishment but one we should take seriously. The PTB intend to unleash hell on the US. The approaching army was sent for multiple purposes all of which come together to form a scenario intended to crush everything and everyone standing for what's good. Violence and chaos - The MS13 Cretans are intended purely to terrorise the public and spread panic. The People are the Cabal's worst nightmare right now and this is how they would like to put us all in our place. Supply chains - As mentioned before -human trafficking. Supply chains for human product are rapidly being closed worldwide. This is a desperate attempt to bring the most highly valued commodity back as well as more commonly known drugs that were central to funding the Cabal's interests. Vote manipulation - Are we about to have midterm elections? No, actually we're about to have the 2016 presidential election 2.0. Most of us longtime woke people know one thing about elections - they're bogus.BUT - not now. The methods by which the system was rigged to return a sure result have been over-ridden. The election is SAFE. In other words, it's fair. Every vote will actually be counted. Why does this matter? Another foregone conclusion we cynical types have to think deeper on: The parties don't matter. Republican/Democrat - it's all the same. True,BUT - Those that are fighting the Cabal have to work within the system in place - two parties. Even though the R party itself may have been corrupt, think in terms of conservative vs liberal ideology. Citizens who consider themselves conservative tend to be Christians. They stand for traditional family values, oppose a "nanny" state and globalism and support founding rights such as the right to bear arms. Regardless of what the party leadership does, conservative values are still held by people who identify as conservative. Liberal people stand for nations without borders (globalism), normalisation of abnormal behaviours, censoring of "hate speech" and other "offensive" expressions and tend to support openly what the Cabal perpetrates covertly on the other side (all under the guise of a more tolerant, peace loving culture). Working within a two party system, you would expect those that hold values that align with ours to choose what the public views as the conservative branch to work out their plan and that's exactly what's being done. The midterm elections are the showdown. If Republicans sweep the Senate, POTUS has the win. Don't be confused by the individuals who are running. Some have integrity, others could maybe use a little more. It's less about people than seats. The senate must be under conservative control for the measures to be completed that secure the defeat of the deep state - because on the other side are demons. No jokes here. Who is running for the Democrats in the midterms? CIA operatives. The cesspool that is Langley has all but been dismantled but the operatives who have nothing they can accomplish through most of their traditional means are now running for office in order to stamp out the Storm that is destroying the multi-generational work of their Luciferian masters. This election comes down to life or death consequences for all involved, including the people of the nation. If the CIA controls the senate there is a real possibility that this inevitably descends into open civil war. Most of the public may not even know a war is taking place but this is a do or die situation. Either the cabal goes down or we do. The migrants coming toward the border are going to be voting in the midterms if the establishment has their way. Divide the populace - Because so much of the public is successfully manipulated to be divided and races/ethnicities have been artificially pitted against one another, it isn't hard for "them" to use that foundation now to get people's emotions involved and fighting amongst themselves about political leanings and sympathy for the migrants vs the view that says borders should be secured. If all understood the truth - that this is an INVASION, not a migration of needy foreigners, the answer would be pretty clear but much of the public is easily persuaded that it's a cold-hearted move to block them from entering the country. The Storm is made of spiritual warriors. We know this is a battle of good against evil. We know that we are those standing up in the Name of the Creator against the full might of Satan's power in the world. Q's intel has directly confirmed what we understood before there was a Q. The only power we're relying on is faith. We are serious about praying. Millions of the obscure and anonymous kneel down and pray like their life, their families lives, their country and most likely the whole world depend on it. We pray for the protection of those leading, for the enemy's victims, for justice and for victory. This is the only reason we never talk about "if" we win. We talk about WINNING. The migrants'war-cry is "Nothing will stop us. Only God". Good call. Heaven answers? Mexico committed to stopping the invaders at their border. It would seem this has failed or more likely was an agreement to fail made with the Cabal. Their numbers are growing and still heading north. POTUS has declared a national emergency and is prepared to send the military to the border. 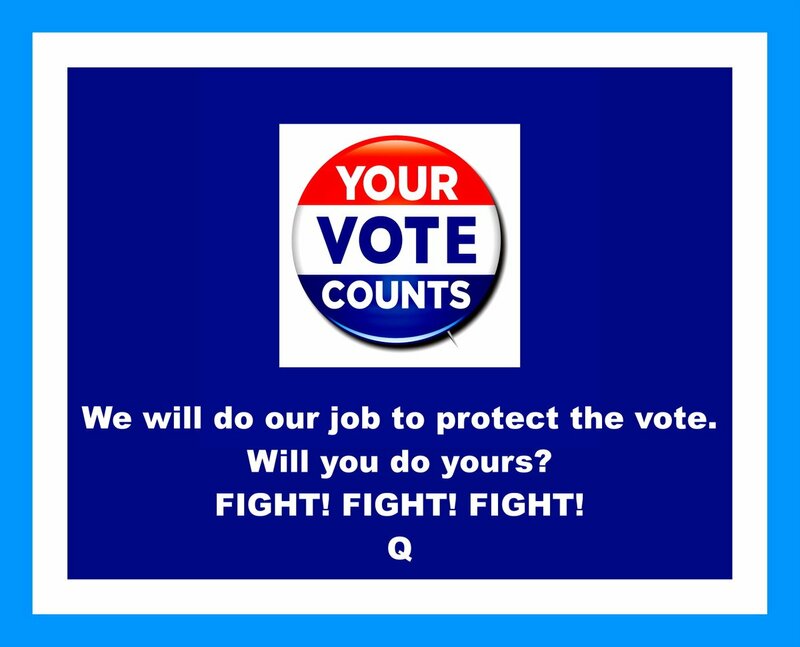 Watch carefully what will happen in the days prior to midterms. This is genuinely monumental and deadly serious times, folks. This is not a game. Do not let "the poor kids" blind you. Look deeper in some of these pictures that are being shown by the media. Many look fit, have cell phones (even smart phones), look clean. I see a lot of nice clothing, good shoes. Many are men, with tattoos even. Do Not be swept away by what is being called the Blue Tsunami. Exactly. Not to mention there's no humanly possible way that these people could hoof it 1000 plus miles. Great news, though - Guatemalan authorities have rescued kids that were being taken to be sold! WINNING!! You Bet its different than any election. Creepy Joe! This guy is buying stock in depends. It just so happens that old Joe has chosen to be such an idiot that he's openly groped all over little girls on camera numerous times in his career. Now this brain damaged jerkface is losing his crap, knowing full well he is so much toast. A battle for America's soul, indeed. "Now this brain damaged jerkface is losing his crap, knowing full well he is so much toast." All staged as planned 30 or more years ago. The Old World Order is programmed to burn itself to death and "Out of Chaos Comes Order"; the NWO. Exactly as pictured on the front cover of the Economist magazine #issue Jan 1988. They even painted a badge labeled 2018 on the rising Phoenix pictured on the Economist magazine. Creepy Joe is possessed by a negative entity. If his meat-suit is hung from a lamp-post it will make no difference to the demon as the possessed mortal has completed his task for haSatan. The demon will simply possess another sinner similar to the pigs that ran off the cliff when they faced Yahushua. Specifically shows a prediction of a Global currency. The NWO, of course is a globalist agenda. This prediction is actually polar opposite of what's taking place which is a Nationalist revolution. A complete and total 180 from the global agenda of a NWO. In case anyone was still confused, DJT announced himself officially and publicly a Nationalist (which of course we already knew), just last week. A global currency is not forthcoming, nor is a global government. Not on our watch, anyway. What can i say? The devil has plans. He always has plans, and predictions and charts and graphs and pictures. We're gonna mess them up. Border Patrol agents assigned to the Rio Grande Valley Sector apprehended violent criminals and gang members traveling with Central American migrants. Some of those include members of the most violent gangs in the U.S. and sexual predators against children. Yahushua has a perfect plan - right. He trains everyone via dreams / visions; correct ? So, let us say that you are correct and the NWO has been put on hold for at least another 4 year US Presidency. So why would YHWH have trained many who are willing to accept the burden of faith in His Word, when nothing is set to happen for at least another 4 years ? i speculate (from my visions) that many 40 Year Trials are coming to a close right now. In other words, mortals, world wide, are now spiritually trained and ready to battle the daemons that reside in this realm. So why would YHWH hold back when His followers are ready for the final battle that He trained them for in the first place ? Crumbs mate, bring it on. Many of us are already standing in the Lake up to our left foot, sinistrous side, Achilles Heal in the Lake. Hence, we know how fatal a teeny weeny sin can easily send our right foot into that Lake. i hold a Bible on my knee whilst standing with my right foot on one of the few hematite sandy islands in the Lake. i just wish a seraph could verify this vision of the Lake that shows why the only sounds that are heard in the Lake is the wind and the flames, even though every sinner is screaming cries of agony that are quite indescribable. "He trains everyone via dreams / visions; correct ?" Not universally correct. Not everyone is given dreams and visions- this is a pretty specific gift but He uses countless ways and means to teach His people - sometimes it's just through life's experiences. "why would YHWH have trained many who are willing to accept the burden of faith in His Word, when nothing is set to happen for at least another 4 years ?" Well firstly, 4 or 5 years is nothing, even in the average human lifetime. If these things happen directly after Trump's terms it will be here before you know it. BUT - believers all through history, most of which will not physically live in the end days have all been training for and fighting the great war that's reaching a peak now. We are all placed in the time we belong. If we're here to see this right now then, believe me, this is where YHWH planned for you to be right now. "Born for a time such as this." Founder Cyprium created this Ning Network.